WEST COLUMBIA, SC -- An Airport High School educator has been selected as American Legion Teacher of the Year. 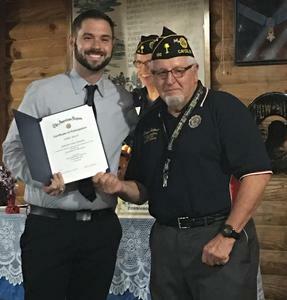 Daniel Bailey, who was last year’s Lexington Two Teacher of the Year, was honored at a reception earlier this week with the award, presented by Cayce Memorial Post 130. Among criteria for his selection was a collection of Bailey’s teaching experiences as well as letters of recommendations from principals, district leaders, students and parents. “This honor is very humbling for me,” Bailey said. “As the grandson of a veteran, I recognize the importance of serving others in many different forms. Like our veterans who serve in the military to protect our country and many of our freedoms, I look to instill this thought in my students to realize the importance of serving others. I am blessed with this opportunity every day when I teach student leadership, to show and exemplify what serving others looks like. Bailey grew up in the district and attended Lexington Two schools -- Springdale, Fulmer and Airport, graduating in 2006. He started his teaching career with Lexington Two in 2012 at Pine Ridge Middle before moving in 2016 to Airport, where today he works with the high school’s nationally recognized student leadership program. He holds bachelor’s and master’s degrees from the University of South Carolina.